Ask Away: Do Company Dress Codes Matter? Welcome to Ask Away, Recruiter.com’s new weekly column! Every Monday (we know, we know: today is Wednesday. But usually we do Mondays! ), we’ll pose an employment-related question to a group of experts and share their answers. Have a question you’d like to ask the experts? Leave it in the comments, and you might just see it in next week’s Ask Away! 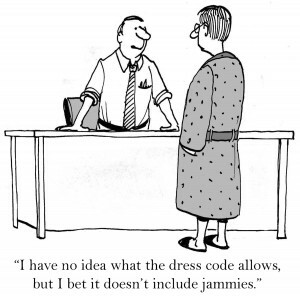 This Week’s Question: Every company has a dress code of some kind, it seems. We think, of course, of the traditional business attire of Wall Street, but even the jeans-and-hoodies-clad startups have certain rules (whether spoken or unspoken) in place. Still, we seem to be living in a time of great change: many companies are growing more and more relaxed about what constitutes “proper business attire.” Which leads us to this week’s question: what good are company dress codes, anyway? Do they matter? Why? “To me, the bottom line for dress codes in most of the companies I write policies for is that they’re in place for the people who don’t know how to dress for work. They don’t target the employee who understands professionalism in the workplace, even when business casual and jeans are acceptable. Most people read the policy once (or look around at their coworkers) and know that a tank top, low-rise pants, or an ultra-short skirt are not acceptable. “I am a paralegal by title, but also serve as the office manager, HR, marketing, and all-around hat rack. Dress codes, in my opinion, are important. The reason really boils down to understanding what your client/customer expects. For example, in the legal field, image is extremely important. Every client wants a knowledgeable attorney who can accomplish their goals. They want someone successful. That first impression of [the attorney's success] is based on whatever the [client] sees when they walk in the door. The better dressed the attorney, the more successful they seem to the client. “I work at a company called BodyLogicMD. Even though we’re the corporate headquarters for a national medical franchise, we have a relatively laid-back dress code. Since we aren’t a client-facing office, there isn’t much need for us to get all dressed up every day — especially in South Florida. “While the employee is working, he/she should be promoting the company’s vision, mission, and brand. If the vision and mission of your company is professionalism, dedication, and customer-focus. the dress code is more professional and business-oriented, especially when interacting with prospective clients. If the company vision and brand is more creative and whimsical, the dress code may be more colorful, unconventional, and relaxed. If the company wants to be immediately recognized from a distance, the dress code may be a uniform with the company logo. The dress code depends on what the company really wants to present or market to the world. “We spend almost zero time and attention focusing on what our team members wear. For us, the work they do is much more important than the attire they choose. With that in mind, we do have guidelines that we encourage our team to be mindful of, such as lengths and fit. Our unofficial dress code is ‘Wear whatever makes you comfortable that doesn’t make others uncomfortable.’ Interestingly, this lax dress code means that most of our team errs on the side of more conservative and professional dress, but that doesn’t mean that you won’t see folks walking around in t-shirts, shorts, and flip flops. “Dress codes serve two main purposes, and while many offices have eased up on their employees’ expected attire — especially in the tech sector — [dress codes] still exist in some way or another. Even those relaxed dress codes you see in movies about Facebook exist for a reason. “The first idea is that your employees’ attire speaks for the company. Suits and ties show wealth and confidence, which are both two important traits in a profession that [lives] on selling people the dream of getting rich — think Wall Street. “On the other hand, some dress codes can exist to draw in talent. Hoodies and jeans exude a laid-back atmosphere, which sounds like the [kind of] place a talented software developer might want to work.